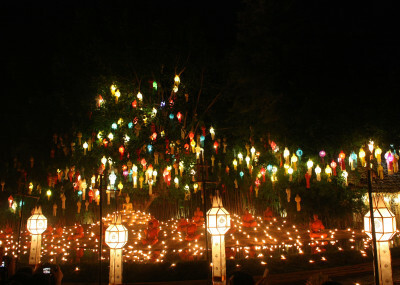 Two important festivals coincide in late November Chiang Mai. 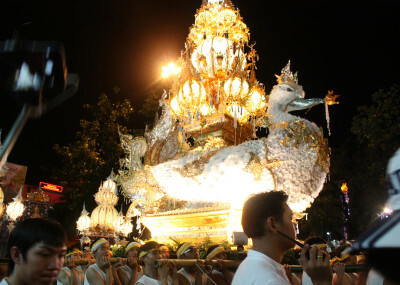 While their origins vary by location and religion, they both represent a solemn reverence for spiritual beings. 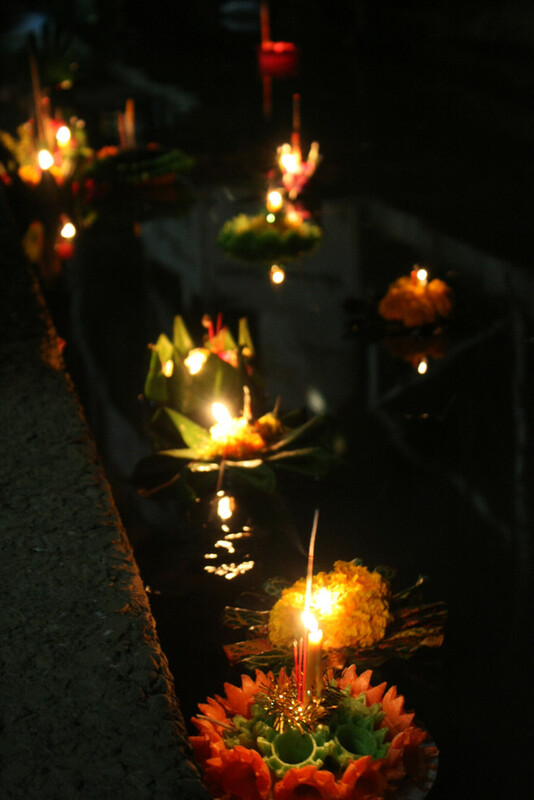 Loi Krathong involves placing a candle inside a decorated banana-leaf basket, then floating that basket down a river, traditionally paying respect to the Hindu Goddess of Water, more recently a Buddhist symbol of clearing transgressions to make oneself whole. 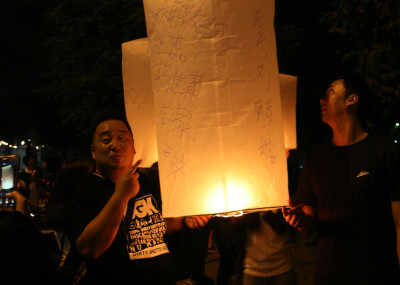 Yi Peng releases candles in the sky instead of on the water, with rice-paper lanterns drifting into the infinite black, showing rebirth in heaven. Normally I have as much patience for religious symbolism as feral cats have for baths — I run hissing in the opposite direction with my claws eager to meet anyone standing between me and the door. 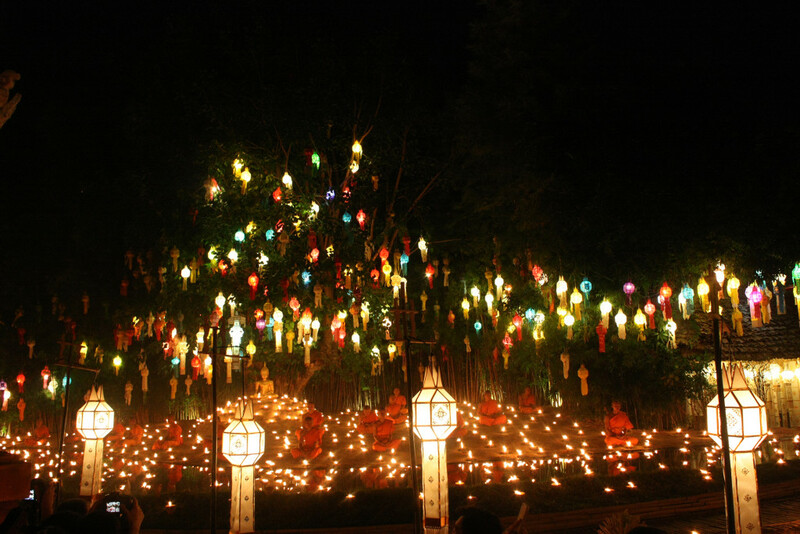 But engulfed in floating lights that swim in the sky and the water, the echoing chants of monks resonating beneath a glittering tree — it overwhelms the senses. I couldn’t tell you the length of the ceremony at the Buddhist temple, only that I was mesmerized for its entirety. At least the atmosphere outside the temple quickly shook off my spiritual daze. The celebrations in the wats may be somber, but walk out the gates and you’re suddenly flooded with a Thai public ready to party. Lengthy parades with towering floats, rock music blared from truck-bound speakers leading dancing throngs down the street, waves of crowds ready to wash you with them if your feet aren’t securely bolted to the ground. And the ever-present sound of gunpowder explosions, igniting the sky in bright colors, the smell of their smoke an integral part of the ritual. 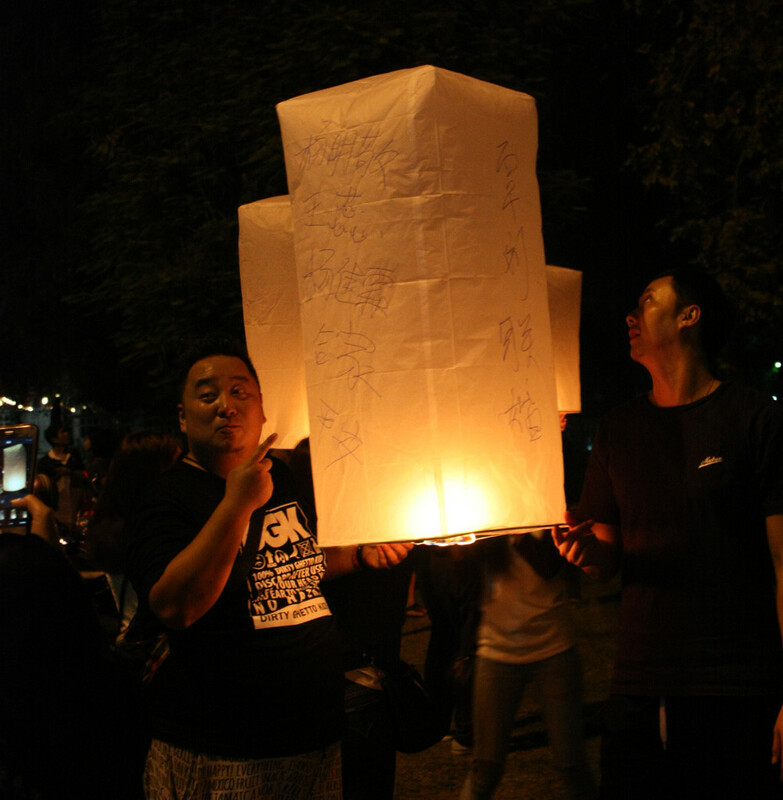 Outside the temple walls, flying lanterns are still lit, baskets still released into the river, but to a jovial soundtrack with swagger, celebrating the joys of humanity instead of showing reverence to the spirits. Is this all a terrible case of old traditions ruined by careless youths — or maybe the effects of nascent tourists, most whom don’t have patience for the more spiritual events? Am I part of the problem? These questions clouded me near the end of the celebrations. Which is when I stumbled upon a group of carefree monks, post-somber ceremony, laughing while lighting their own fireworks over the river. I realized that this duality is the tradition — it’s always been. 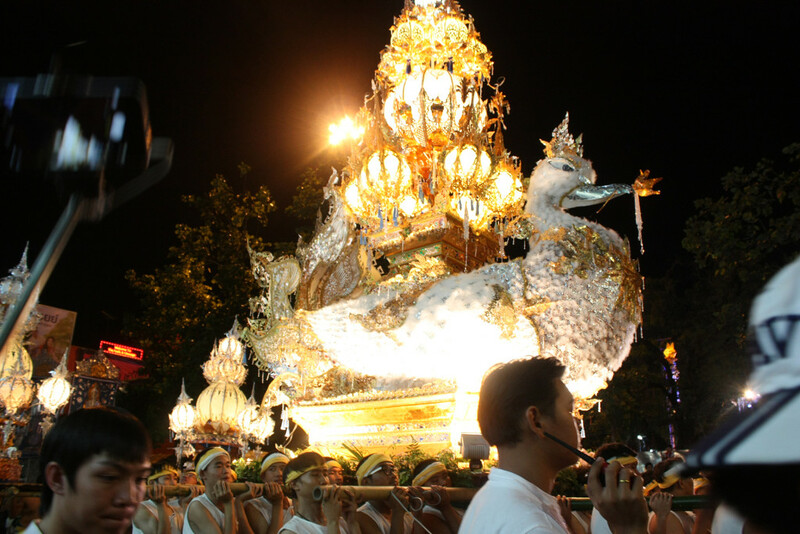 Though much of Chiang Mai has changed in the last generation, I have to imagine these celebrations, while considerably smaller, would always have included both paradoxical sides. 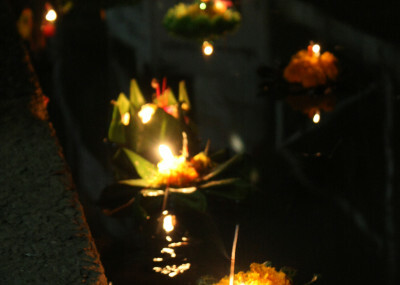 I’ve begun to learn that the combination of ebullience and rumination is a very Thai ideal. Outside and inside. My game hasn’t seen much content created this week. After developing the style-demo, I realized I still had a lot of questions, so I’ve been gathering more inspiration. I’m creating mind-maps for every aspect of my game — my influences for visuals, writing, audio, and gameplay, all re-watched, read, heard, and played, with more scrutinous notes for their second spins. I’ve also set the requirements for my next milestone — the vertical-slice demo. There isn’t much more to share right now, but I’ll make sure to always keep you updated. Thanks for reading! Fire and water sounds like the gastrointestinal distress I feel after eating a whole bunch of Thai street food… inside and outside!